Please call if the disc you need is not listed. Pearl Resin Fiber discs are also available in 4″ x 5/8″, and 4 1/2″ x 7/8″ sizes, and all are available in a variety of grits. 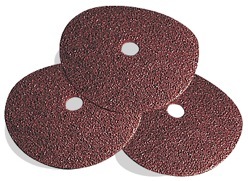 Resin Fiber Discs are also available with a Zirconia abrasive if the Aluminum Oxide won’t work for your application.